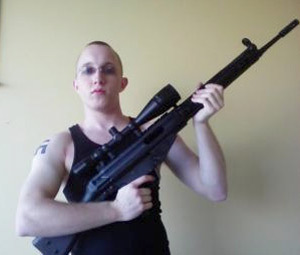 A Tennessee White Supremacist who planned to go on a killing spree of African-Americans and kill Barack Obama during his campaign for the presidency is off to prison for 14 years. Daniel Cowart, 22, of Bells, Tenn. was sentenced Friday in Tennessee after he pleaded guilty earlier in the year to a host of charges including conspiracy, threatening to kill and inflict bodily harm upon a major candidate for the office of President of the United States, interstate transportation of a short-barreled shotgun and interstate transportation of a firearm for the purpose of committing a felony, the Justice Department said. Cowart admitted to conspiring with Paul Schlesselman of West Helena, Ark., to go on the killing spree. Schlesselman was sentenced to 10 years in prison. Posted: 10/25/10 at 8:06 AM under News Story.